As a stay at home mom, I’m always looking for something comfortable to wear around the house but will also look decent if I run out to the store. 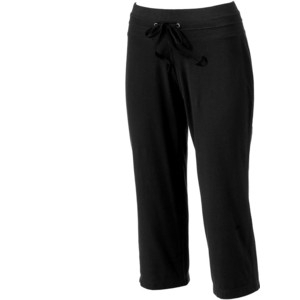 Comfort and style do not lack in these Capri pants. The best part about them is they are truly the most comfortable lounge pants I’ve ever worn. They are very soft and wash up quite well. I have them in black, navy and grey. after wearing the same pants over and over again I knew I needed more of them. They are made of cotton/polyester/spandex but feel as if you are wearing very lightweight cotton. I’ve used them to go running in as well and I don’t get too hot wearing them. They supposedly have some moisture wicking abilities which I guess is true because I’m a pretty heavy sweater and you don’t really see any sweat marks on these capris. I’m a taller than average woman, 5’9” to be exact and I normally wear extra large pants due to the longer lengths. Extra large usually runs big on my waist though so it is very hard to buy loungewear for myself. With these pants, I bought a large and I feel like I even have a little extra room in the waist with these. The length is perfect though which leads me to say that they do run a bit longer than most activewear/loungewear pants. An added bonus is that they have a very functional drawstring so if they are a little loose, you can just tighten with the drawstring. I’ve had pants that sit so low on the hips that a drawstring doesn’t do much. in that load came out blotched. I put the navy and black pants in that wash load too and they came out spotless; no blotches at all. That only goes to show how well they wash up. You can buy them for a retail price of 30 USD but I wouldn’t pay that much as they are ALWAYS on sale at Kohls. Check them out if you are in the market for comfortable loungewear that holds up to the most extreme conditions.